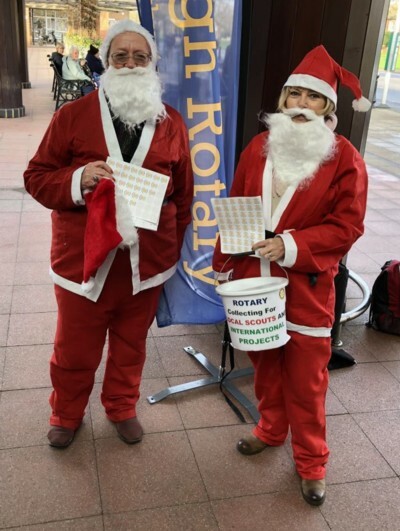 This year's street collection by members of Cranleigh Rotary in the days before Christmas was a great success, raising more than £1,700 for various organisations and charities. 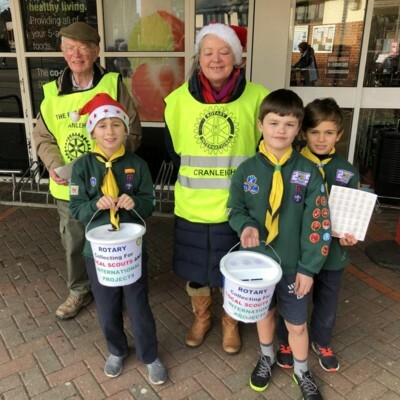 The main beneficiaries of the collection will be Cranleigh Scouts, and members of the local Scouts, accompanied by their parents, joined in the street collection for the first time. "This is a magnificent achievement and I would like to thank everyone for giving up their time to make this such a great success," said Rotary President Brian Arendell. "Once the figure for gift aid has been included, it is likely that the 50% contribution to Cranleigh Scouts from the collection will rise to at least £1,000. A great result." "We had a wonderful three days, very successful in lots of different ways," said Rotarian Jane Briggs, one of the lead organisers. "Raising a total of just over £1,700, we collected £760 of that on the Saturday in just four hours! Rotarians often wore Santa hats, or, in some cases, full outfits, and on Saturday we had lots of help from the Scouts. "In fact, between three and four in the afternoon in Stocklund Square, the Scouts entertained the public by singing carols and this went down very well!" 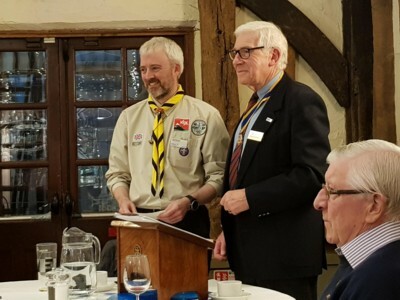 On 7 February 2019, Colin Desmond, the assistant commissioner for the Cub Scouts, received from President Brian Arendell the cheque for £1,700, which resulted from the street collection. Colin also gave a very interesting talk on the work of the Scouts (photo below).